As our month of shop features continues, please let me bring your attention to a couple fabulous shops owned and operated by Laura, who is a talented textiles artisan. Prairie Threads and Prairie Peasant both use only upcycled materials. We are focusing on Prairie Threads today, but be sure to check out Prairie Peasant also. It has a fun selection of journals, including travel journals, sketchbooks, envelopes, and more. It makes my heart happy just looking through her shops, both of which are bright, fun, and very well laid out. You will have a wonderful time browsing through her many fabulous items. As we are doing a focus on tarn this month, one of my first questions to Laura was how started working with tarn. Laura has had an incredible adventure with tarn, as she describes it, "My first foray into using tshirt yarn was in 2009. I was part of the TransCanada Etsy Team, and as a promotion for Canada Day we did a joint project where members cut up t shirts into strips, and the shop FiveForty wove them into a gorgeous rug that one lucky person won (see the lucky winner and rug here. After this, I learned that after cutting the strips you can stretch them, making the edges curl, and making a yarn that is nice to knit or crochet. I made a set of rainbow t shirt yarn for a gift the next year, but the rug I am currently working on is my first project where I am actually using the yarn myself!" The gift of a rainbow of balls of tarn was a wonderfully thoughtful gift. If you haven't already clicked on the link you should give it a look. 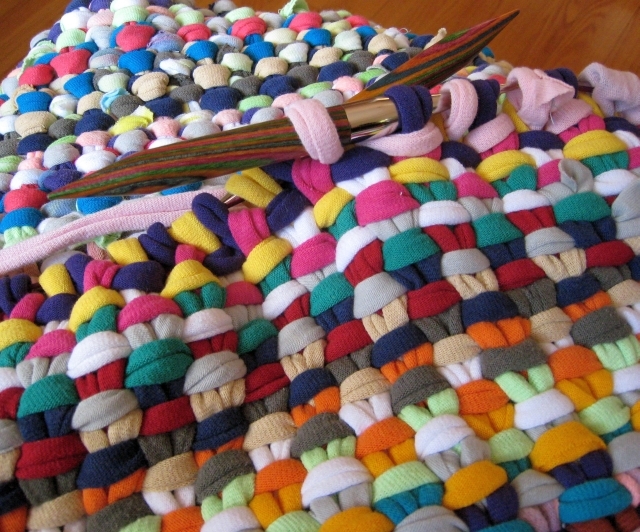 The rug is turning out beautifully, as you can see from the pictures below. I just love the colors on this rug! So beautiful. Laura said that the thicker tarn, which would be a 4 or 5 WPI, is working well for this rug. 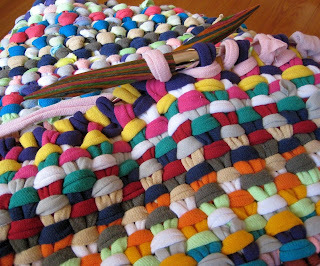 The thicker tarn WPIs are wonderful for rugs and what I usually recommend using, however, she said that she has seen thinner tarn (6-8 WPI) used for everything from hot pads and placemats to tote bags and even a bikini! The bikini is a new one to me, but I would love to see it. The thinner tarns are wonderful mediums for all of those things. I also want to give a shout out to Laura's coiled bowls and mats. They are absolutely lovely. A must have for any home. 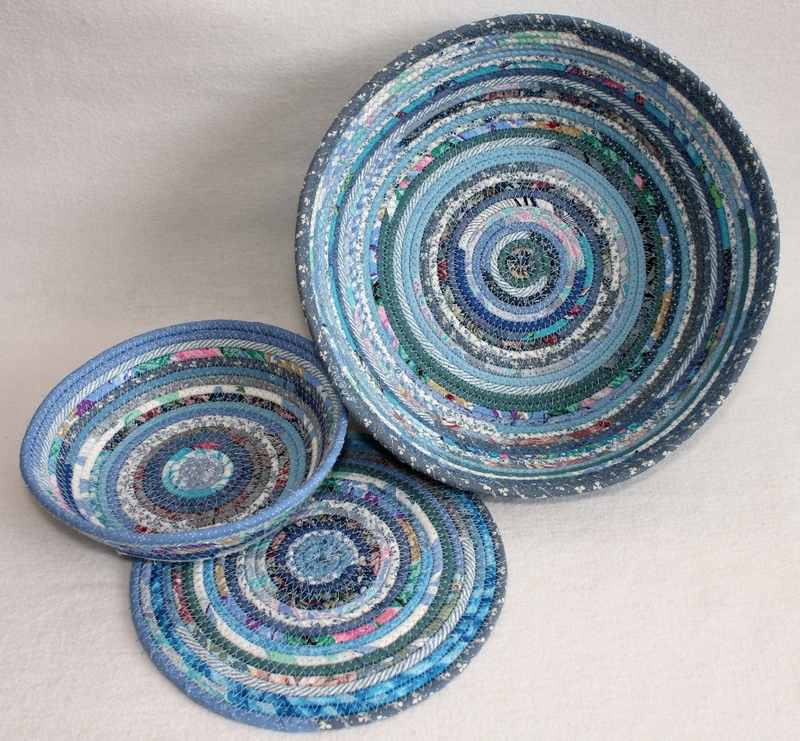 Laura was kind enough to send me a picture of a set of her blue bowls with a mat. One look and you can see why I am so in love with these. They are made from coils of fabric that Laura then sews together to create durable and long lasting items you will be proud to use for many years to come. You will even find coasters made in the same way. Laura told me that enjoys what she does creatively and it shows in her work. In Laura's words, "It's so much fun to take some unwanted object and transform it into something new and useful. I am proud of my work and would never sell something that I myself wouldn't be happy have in my home". Laura has two wonderful shops going and says, "The focus of both of my shops is on making beautiful functional items out of recycled and repurposed materials. I would like to be able to say that there is a shortage of materials to work with, that all goods were used until they wear out, but unfortunately there is so much that is routinely discarded and I make new finds at thrift shops or friends give me unwanted fabric or paper all the time". Well said, Laura. You can find Laura on Etsy, of course, but be sure to check her out on her social media sites I have listed below. Give her page a like or follow her to be the first to see the new items as they come out! Tell her Idle Hands sent you! Thanks Luci for such a fabulous feature! I look forward to seeing more features this month! Those bowls are amazing!! 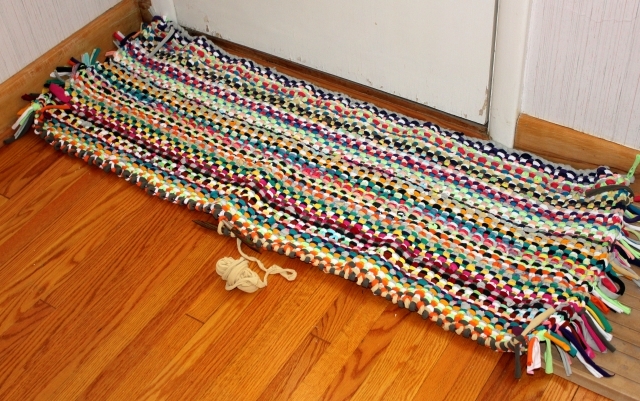 And the rug is super cute! My grandma had a couple rugs like that when i was a kid. Very nice feature! Love the bowls too!